glƏƏk! 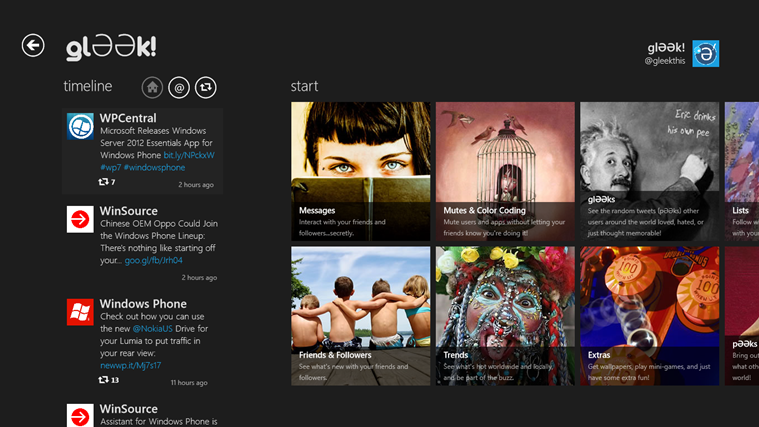 for Windows 8 Is Released! Finally! The wait is over! 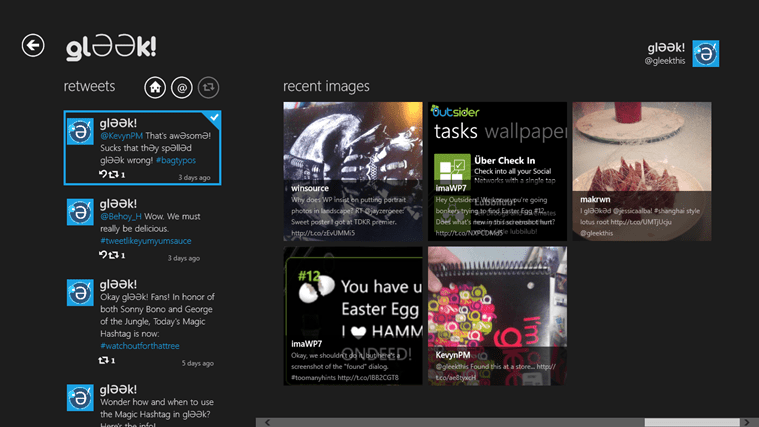 Gleek joined the Social Club on Windows 8. 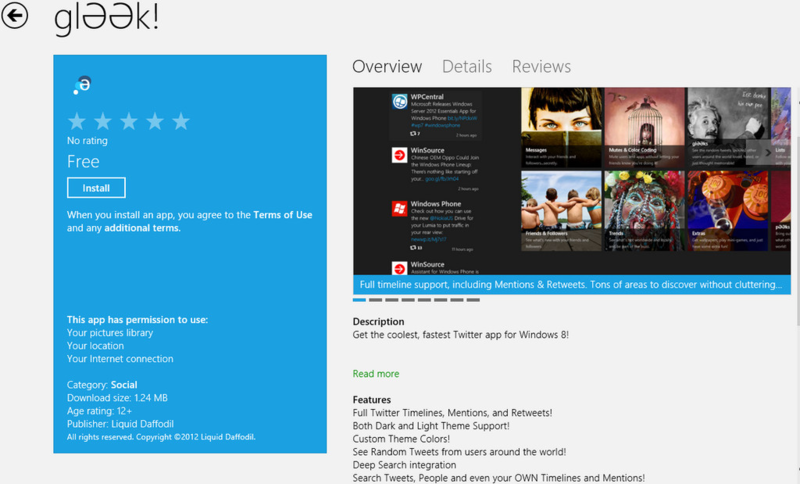 Get the coolest, fastest Twitter app for Windows 8! 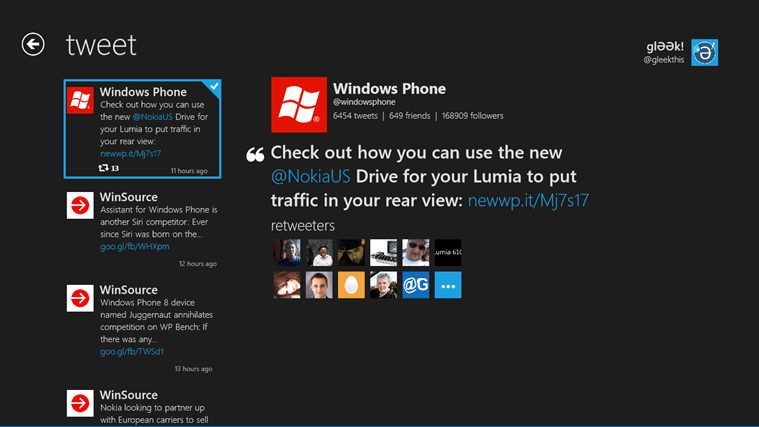 An (almost) fully loaded version of the coolest Twitter app for Windows Phone is now available on Windows 8! This is an “Über Fan Preview” to get it into everyone’s hands before the “fully loaded” version is available at the release of Windows 8. Not only glƏƏk! the most full-featured Twitter app in the Store, but is also the ONLY app that will bring you random tweets (pƏƏks) from users around the world! Both Dark and Light Theme Support! See Random Tweets from users around the world! Cool Extras, like SnƏƏk PƏƏps! and so much more! I can’t add an account. It closes everytime I try it. I was able to add an account, but after a while it was showing me Twitter’s FailWhale and then closes. Guess there is still work to do for the vendors. Great concept tho. OK, Account issue is now fixed, you should be able to add accounts now. Let me know how it went. The link says “This app is no longer available” in the Windows store. Hmm…..
Well, it is now! So go get it. Yes, Gleek has been having issues with the app in the Store. They’ve released a few update patches, but it has resolved all issues. Try a few weeks down the road. I am sure they are hard working on it.